Formerly known as Tomakomai CC - Brooks Course. 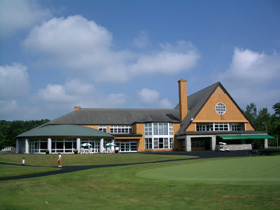 The course is a hillside course with woodland and Links flavors, which help the course to differentiate from others. In the front 9, each hole is separated by trees and many holes have ups and downs to utilize the undulations of the natural terrain. The back 9 is a Links style course on a wetland. Unlike the most of the other, roughs are long and dense, so hazards as well as the roughs come into play at each hole, which makes the course strategically challenging. A straight hole with the downhill tee shot followed by the uphill second and third shots. The landing area of the second shot is narrow and protected on both sides by trees and bunkers. The green is big and two-tiered. A dogleg to the left. A circle bunker is positioned in the middle of the fairway 240 yards off the tee and a carry of 260 yards is needed to clear it. The second shot is slightly uphill. A bunker protecting the right front of the green is deep. A lovely par 3 with a wide green. A straight hole with the slightly downhill tee shot. Although there are no fairway bunkers on this hole, it is demanding as the landing area of the second shot is tight and the third shot is over a wetland. The green is double-tiered with left and right. A dogleg to the left, short par 4. Fairway bunkers seen from the tee look charming. The second shot is over a wetland. The green is narrow and deep. A straight and long par 4. The fairway is relatively tight. The tee shot should be hit onto the right side of the fairway in order to clear view to the green avoiding left trees on the second shot. The green is wide. A difficult hole overlooking the beautiful clubhouse. The tee shot is blind but the contrast between a green and the clubhouse behind is impressive when you are hitting the second shot. The big green is elevated and slopes from the backs to the front. This is another hole besides the 15th where you are happy with par . It is a 20 minutes drive from the New Chitose Airport. A sauna is available. The restaurant is nice. The services of the employees including caddies are good thanks to the fact that the club is owned by JAL, a Japanese airline company. The other Taizo Kawata designed courses in Japan are Narita GC, Lake Hamamatsu CC, Saga CC, Art Lakes GC, Yoshikawa CC and son on. He is also famous for remodeling of Kausmigaseki CC – West Course and Chiba CC – Umezato Course.